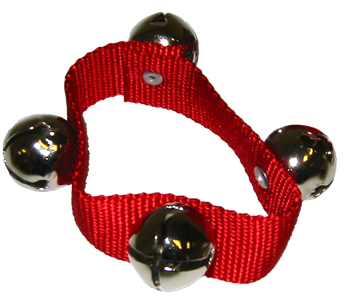 This rattle is perfect for babies because it is easy to hold, safety tested for infants, and has a nice sound. Age-rating: 0+. A variation on the traditional Japanese instrument called a "kokiriko." 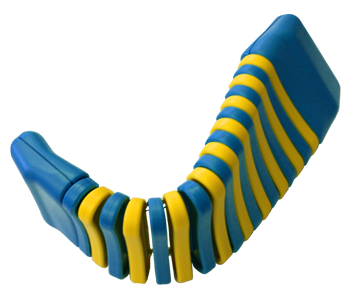 Brightly colored with easy-grip handles. Bend it like a caterpillar to make it clatter! Caution: Children really enjoy this, but it is an instrument, not a toy, and can be broken by enthusiastic youngsters. Recommended for ages 3 and up under adult supervision. 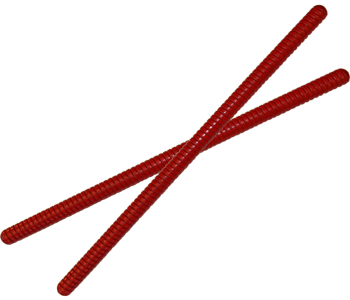 14"-long, non-toxic, wooden rhythm sticks made of durable, quality hardwoods with a red enamel finish. Includes two ribbed sticks per pair. 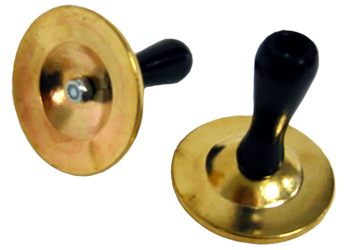 Beautifully toned, these brass finger cymbals include special easy-to-use "Wobble-Fit" wooden handles adapted for small hands. The cymbals meet the United States Consumer Product Safety Commission requirements for lead safety for children under 12 years old. 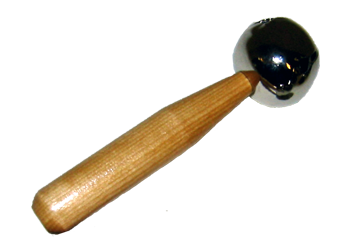 Large jingle bell sits atop a beautifully finished hardwood handle. 1½” bell made from tempered bell metal alloys. Highly polished and plated to create a clear, resonant tone. 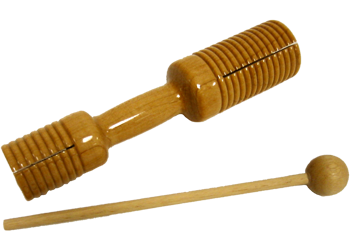 Two fluted wood heads for high and low pitches make a sound like a horse clopping. Excellent resonance. Wood mallet included. 4-note pine wood whistle with great train sound! 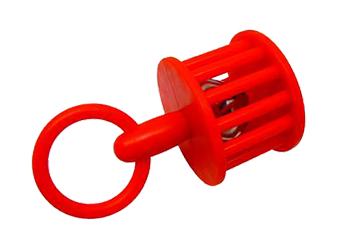 Your very own train whistle. 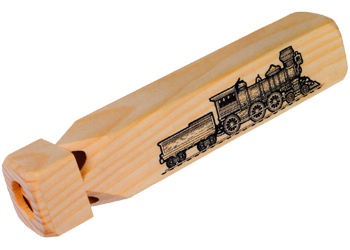 This wooden, 4-tone pine train whistle sounds just like the real thing. Recommended for ages 2 and up. 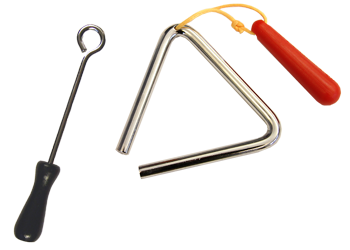 Our triangle set includes a 4” triangle with red plastic holder and black striker. 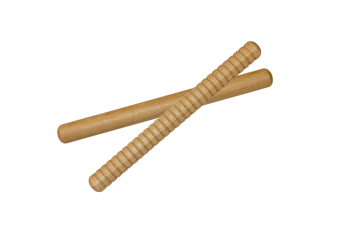 8"-long, wood rhythm sticks with rounded ends for added safety. Includes one smooth and one ridged stick per pair. Age-rating 3+ years.